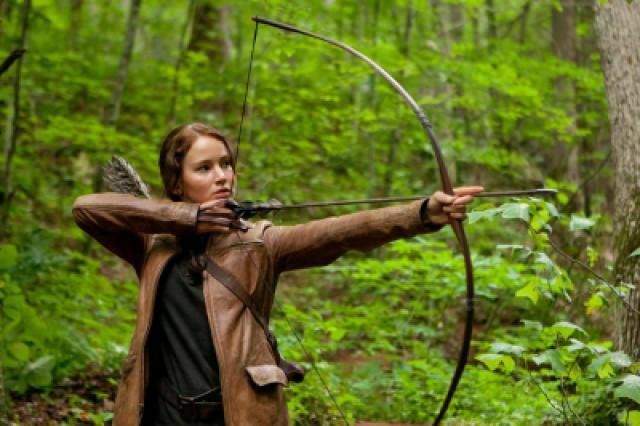 Enjoy these North Carolina photos related to the filming of the movie The Hunger Games. Photos include movie scene locations, as well as hotels, restaurants, and attractions visited by the cast and crew. For the movie, The Hunger Games, one of production designer Philip Messina's first challenges was creating the Seam, the most impoverished area of District 12. In the abandoned North Carolina textile mill town of Henry River Mill Village, a tract of 1920s homes closely matched the setting described in the book. "This area was absolutely perfect for the Seam," said Messina. "We couldn't have imagined it falling in our lap any better than that." Located about an hour from Charlotte (Via Interstate 40 to Exit 119), Henry River Road in the town of Hildebran runs through the privately owned Henry River Mill Village. However, because this is private property, walking around the grounds is prohibited. The house pictured above, located in the abandoned Henry River Mill Village, was outfitted as the small home of the Everdeen family in the Seam, the impoverished area of District 12. In the movie, The Hunger Games, the old company store at the abandoned Henry River Mill Village in Hildebran, North Carolina was transformed into the District 12 Mellark family bakery. Josh Hutcherson stars as Peeta Mellark in The Hunger Games. In the above flashback scene, Peeta tosses a loaf of bread to Katniss on a dark rainy evening. Scenes for The Hunger Games were filmed at Triple Falls, one of four major waterfalls along the course of Little River in DuPont State Forest. Little River at the base of Triple Falls at DuPont State Recreational Forest became a key location for Arena scenes in the movie, The Hunger Games. Bridal Veil Falls, located in DuPont State Recreational Forest, was used as a location for the movie The Hunger Games. Located between Brevard and Hendersonville in North Carolina, Bridal Veil Falls was also used as a filming location in Michael Mann's 1992 movie, Last of the Mohicans. James L. Knight Theater in Charlotte, North Carolina became a set for the interview scenes with views of extras dressed as residents of the Capitol in the movie The Hunger Games. Knight Theater is a 1,191-seat performing arts venue located in Uptown Charlotte at 430 South Tryon Street between Stonewall Street and West Martin Luther King Jr. Boulevard. It is part of the Levine Center for the Arts, which also includes the Mint Museum, the Bechtler Museum of Modern Art and the Harvey B. Gantt Center for African American Arts and Culture. Knight Theater, which is the home theater for North Carolina Dance Theatre, hosts an array of dance and music shows. There is also the Levine Center for the Arts. A warehouse space in Shelby, North Carolina (pictured above) was used for the filming of scenes of the Reaping and scenes of the Hob in District 12. This area is not open to the public. During part of the filming of The Hunger Games, cast principals stayed in mountain view condo accommodations at the luxurious Suites at 151 located on the top floors of Hotel Indigo in downtown Asheville, North Carolina. The Ritz-Carlton, Charlotte is where some of the stars of The Hunger Games stayed during part of the filming. Conveniently located at 201 East Trade Street in the heart of Uptown Charlotte, this luxury, eco-friendly hotel has received a LEED Gold certification as well as an AAA Five Diamond rating. The hotel's elegant lobby is pictured in the above image. Amélie's French Bakery & Cafe, located at 330 South Tryon Street in Charlotte's NoDa (North of Davidson Street) neighborhood, serves French pastries and desserts as well as savory café fare selections. Other features include a European-style espresso bar and a living room with unique handmade light fixtures. Amélie's is open 24 hours a day, seven days a week, year round. During the filming of The Hunger Games, Woody Harrelson who portrays Haymitch Abernathy in the movie is reported to have stopped in to play chess with some of the regular patrons. Early Girl Eatery, located at 8 Wall Street in downtown Asheville, North Carolina, creates Southern-inspired comfort food with a focus on fresh local ingredients. The seasonal menu changes periodically and specials change daily, reflecting the restaurant's motto, made from scratch. During the filming of The Hunger Games, it has been reported that Entertainment Weekly met with Josh Hutcherson for a spread featuring Men of 'The Hunger Games'. Josh Hutcherson stars as Peeta Mellark in the movie. Since Asheville served as the home base for the cast and crew of the movie The Hunger Games for part of the filming, several local merchants had celebrity visitors. Malaprop's Bookstore/café was one of the places some members of the cast and crew stopped in to browse. Malaprop's Bookstore/café is an independently owned favorite meeting place located in the heart of downtown Asheville. In addition to stocking an interesting inventory of books, the store includes a café featuring a literary menu and free wireless service. Frequent events for book and poetry lovers take place at Malaprop's throughout the year. During their stay in Asheville, North Carolina for the filming of the movie The Hunger Games, Josh Hutcherson, Ian Nelson, Leven Rambin, Jack Quaid, Jackie Emerson and Dayo Okeniyi, along with several crew members, zip lined through the Blue Ridge Mountains at Navitat Canopy Adventures. During the filming of The Hunger Games, Woody Harrelson is reported to have visited the US National Whitewater Center in Charlotte, North Carolina to climb the 46-foot rock wall. Home to the world's largest man-made whitewater river, the US National Whitewater Center offers an array of outdoor adventures and activities including whitewater, flatwater and land options as well as a full schedule of special events. Hunger Games Fan Tours feature filming locations used during the filming of the movie The Hunger Games in DuPont State Recreational Forest, offering fans a unique way to enjoy a Hunger Games themed adventure. The tour schedule includes options for day and weekend tours.